Portability, providing a completely cross-platform suite of tools, that can be easily switched from running on NVIDIA GPUs to multi-core CPUs by changing a single template parameter. We built NVBIO because we believe only the exponentially increasing parallelism of many-core GPU architectures can provide the immense computational capability required by the exponentially increasing sequencing throughput. There is a common misconception that GPUs only excel at highly regular, floating point intensive applications, but today’s GPUs are fully programmable parallel processors, offering superior memory bandwidth and latency hiding characteristics, and R&D efforts at NVIDIA and elsewhere have proved that they can be a perfect match even for branchy, integer-heavy bioinformatics applications. The caveat is that legacy applications need to be rethought for fine-grained parallelism. Many CPU algorithms are designed to run on few cores and scale to a tiny number of threads. When the number of threads is measured in the thousands, rather than dozens—a fact that all applications inevitably must consider—applications must tackle fundamental problems related to load balancing, synchronization, and execution and memory divergence. NVBIO does just that, providing both low-level primitives that can be used from either CPU/host or GPU/device threads, as well as novel, highly parallel high-level primitives designed to scale from the ground up. NVBIO offers a fairly broad suite of features; here is a short summary of some of the most relevant ones. Wide support for many string and string-set representations, including packed encodings for arbitrary alphabets (e.g. DNA, DNA+N, IUPAC, Protein, ASCII, etc). Parallel FM-index and Bidirectional FM-index construction and lookup for arbitrary string and string-sets. Wavelet Trees and other succint data structures of large alphabet strings. Parallel Bloom Filter construction and lookup. State-of-the-art Q-Gram Index (also known as kmer index) construction and lookup. A state-of-the-art Dynamic Programming Alignment module, containing Edit-Distance, Smith-Waterman and Gotoh aligners with support for global, semi-global and local alignment in both banded and full matrices, on arbitrary string encodings. A high performance I/O module supporting common sequencing formats (e.g. FASTA, FASTQ, BAM) with transparent, parallel compression and decompression. Overall, the three guiding principles mentioned in the introduction could be probably summarized in a single phrase: expressive performance portability. Unlike other libraries which focus on solving a single specific instance of a problem on predetermined data types, NVBIO embraces the STL paradigm [as does Thrust] and offers fully configurable algorithms and containers, which are adapted and optimized at compile time for the required user-defined types and the backend architecture. For example, consider the problem of finding the optimal alignment of two strings. Many existing libraries target different kinds of dynamic programming algorithms; for example, SSW for Smith-Waterman alignment of ASCII strings on the CPU, or CUDASW++ for the GPU. But most of these libraries tackle the solution of a single, specific problem, on a single platform, and are not very flexible. However, in bioinformatics more than in other fields, developers use many variants of similar algorithms in specific situations. For example, one application might require use of the Gotoh Smith-Waterman scoring with affine gap penalties to compute the global aligment score of two ASCII encoded protein strings, while a short read mapper might want to use the fast Myers bit-vector algorithm for computing the edit-distance between two DNA strings packed with two bits per characters, while yet another application might need to perform banded, local alignment of four-bit packed DNA+N strings with the plain Smith-Waterman scoring. Predetermining and hardwiring all possibilities would be essentially impossible: as the following table shows it would require almost equivalent code paths! NVBIO takes a different path, enabling the user to quickly select the most appropriate algorithms and containers through simple template specialization, as the following example code shows. Notice that while the alignment functions in this case have been invoked by a host thread on iterators over host containers, they can just as easily be invoked by a GPU thread inside a CUDA kernel! NVBIO also offers parallel batch alignment functions, that can be used to easily align pairs of corresponding strings in two string sets, as the following example shows. NVBIO’s containers and algorithms are designed to be highly composable. For example, consider how many aligners use ad-hoc FM-index implementations to perform seed mapping on DNA strands. Now, what if after having spent several months working on your custom FM-index you’d want to write a protein search tool? Proteins require a much larger alphabet, and the simple rank dictionaries based on occurrence count tables require exponential storage in the number of bits per character. NVBIO’s Wavelet Trees can be used as an efficient rank dictionary for large alphabet strings, and can be easily used together with NVBIO’s FM-index class, as shown in the following example (See the full example on Github). // want to show that NVBIO is designed to make everything work! // in a real app. The following graphs show the staggering performance of some of NVBIO’s parallel algorithms running on NVIDIA Tesla K40 Accelerators, for tasks such as FM-index lookup, DP alignment and BWT construction for very large read collections. 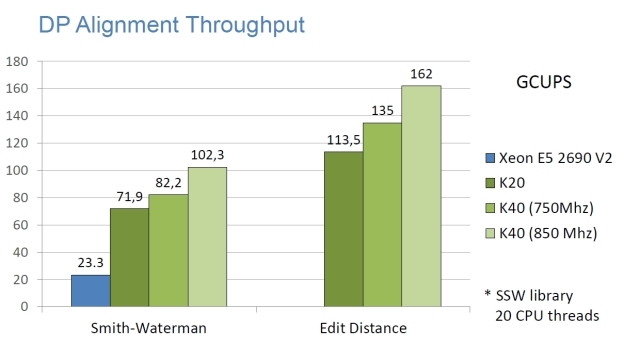 NVBIO DP alignment throughput, comparing to the SSW library running on 20 CPU threads. 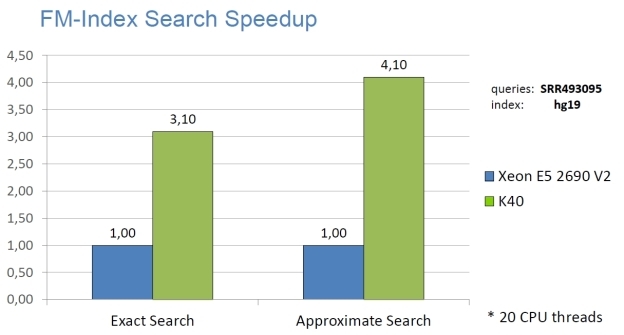 NVBIO FM-Index Search Speedup on an NVIDIA K40 compared to 20 CPU threads. 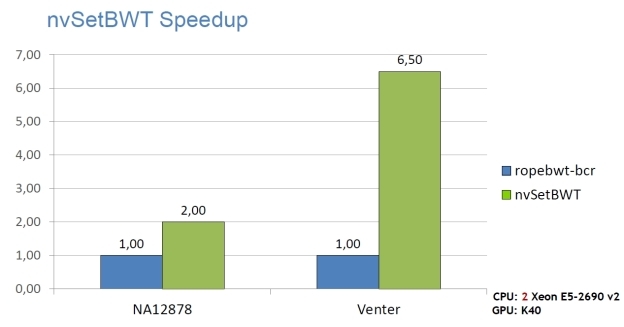 NVBIO BWT speedup, comparing an NVIDIA K40 GPU to dual-socket Xeon E5-2690 v2. NVBIO is interoperable both with the high level Thrust C++ parallel algorithms library and lower level OpenMP and CUDA environments. Like Thrust, NVBIO offers full performance portability, providing both CUDA and multi-core CPU implementations for most of its algorithms. NVBIO contains a suite of prebuilt high-performance applications. nvBowtie: an industrial-strength replacement for the popular bowtie2 aligner, providing almost the same exact specificity and sensitivity characteristics, at a great speed advantage. nvBWT: a single-string BWT construction application, which can construct the BWT of a human genome in just under 2 minutes on a single Tesla K40—compared to the 15+ minutes required by state-of-the-art CPU software. nvSetBWT: a state-of-the-art read indexing application, which can build the BWT of 1.2B x 100bp reads in under 1.7 hours. NVBIO is open-source software, distributed under the BSD Licence. The primary developers are Jacopo Pantaleoni and Nuno Subtil. You can get NVBIO on Github at http://nvlabs.github.io/nvbio. NVBIO has been designed for GPUs supporting at least CUDA Compute Capability 3.5. Due to the high memory requirements typical of bionformatics algorithms, NVIDIA Tesla K20, K20x or K40 and above GPUs are recommended. NVBIO is under active development, and as we are writing this article, we are targeting even more applications and bioinformatics domains. If you have specific comments or requests, please comment below or check out the NVBIO Users Forum. Jacopo Pantaleoni is a Senior Architect at NVIDIA, where he currently leads the development of NVBIO, a high performance library for sequence analysis. 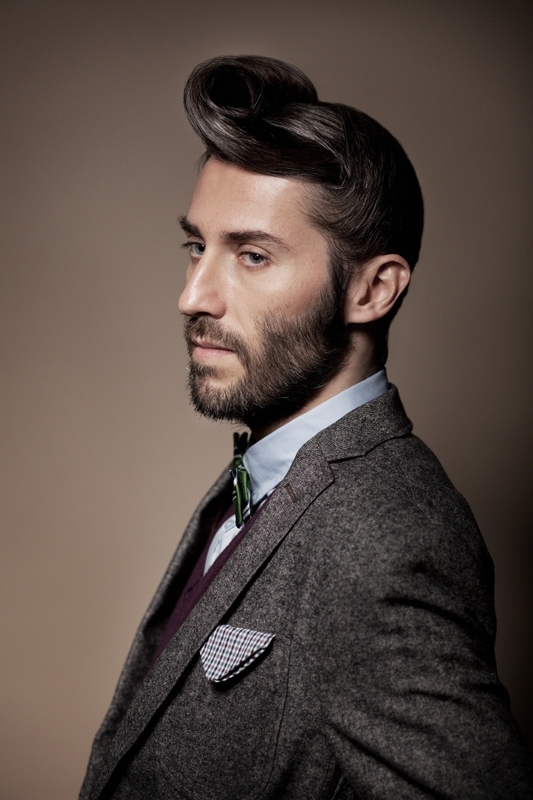 As part of this effort he has developed the first and fastest massively parallel algorithm for incremental BWT and FM-index construction of large-scale genomic databases (http://arxiv.org/pdf/1410.0562.pdf), as well as nvBowtie, a full-featured re-engineering of the popular Bowtie2 aligner targeting multi-GPU systems. He has also been driving collaborations with the Broad, Life Technologies and other research centers and institutes in order to spread the adoption of GPU acceleration in bioinformatics. Prior to that, he has worked as a Senior Research Scientist at NVIDIA Research, where he has been studying new stochastic methods for physically based light transport simulations, developing novel rendering techniques for the film visual effects industry (contributing key technology - the PantaRay engine - for the Oscar winning special effects in Avatar), providing new algorithms for real time ray tracing and rasterization, and studying the feasibility of complex, programmable software pipelines on massively parallel processors. Prior to joining NVIDIA in 2008, he has founded Lightflow Technologies in 1999, developing one of the first publically available global illumination engines. He later worked as a rendering expert in the film industry, has co-authored a book on production rendering and joined mental images in 2005 where he worked as Lead Rendering Research Scientist to develop interactive photorealistic rendering solutions. Jacopo studied Mathematics at the University of Padova, Italy.